Staff and students of the ALPHA Centre were delighted to receive much needed equipment from the local representatives of United Insurance Co. Ltd - J. B. Charles & Co. Ltd, C. A. M Dupigny Inc. and L. A. Dupigny Co. Ltd. The Alpha Centre is run by the Dominica Association for Mentally Handicapped and caters to the needs of physically and mentally challenged children. The students of the Centre build their own furniture and often receive requests for special pieces as well; therefore the tools donated by United Insurance will be put to good use. A laptop was also among the equipment donated and will be used in the Computer Centre. It is hoped that these gift items will enhance the quality of the ALPHA Centre's products and challenge the mental capacity of the students. While making the presentation, Marcel Nicholas of J. B. Charles & Co Ltd noted that they were excited to assist the Centre and provide support to these special children. "Our purpose as a company is to improve the lives of our clients by giving them peace of mind through our insurance coverage. We'd like to think that this Centre performs a similar role in that parents have peace of mind knowing that their children have every chance to excel at different disciplines." In accepting the equipment, Brother Raymond Philogene, Coordinator at the Centre, thanked United Insurance for supporting the children and the Centre with these gifts. "We are very thankful for this donation as these items will greatly assist with the development of our children. We want to thank the team at United Insurance for thinking of us." J. B. Charles & Co. Ltd and C. A. M Dupigny Inc. are the local Agents for United Insurance - one of the leading general insurance companies in the Caribbean and which operates in 14 countries. Like United Insurance, these Agents actively support the community and are sponsors of the local Secondary Inter-Schools Cricket Competition as well as the United Insurance Starks Basketball Team who compete within the DABA National League. Photo caption – Bro. 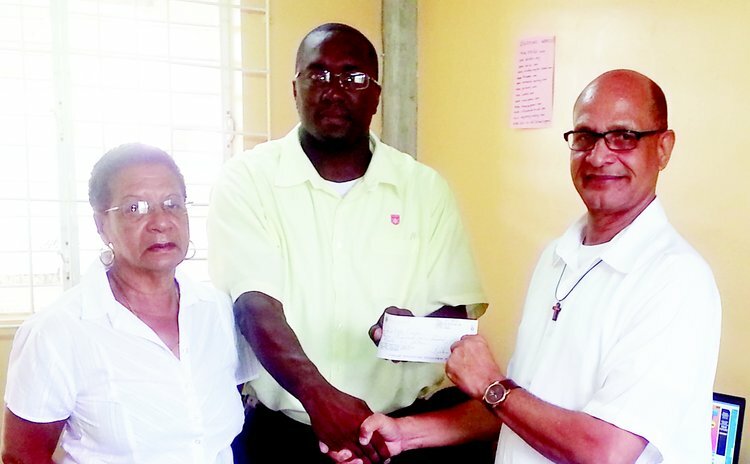 Raymond Philogene accepting the donation on the behalf of the Centre from local representative of United Insurance, Marcel Nicholas whilst Mrs Sandra Robinson, Managing Director of J B Charles looks on.